Mick McCarthy has been in charge at Ipswich since 2012. 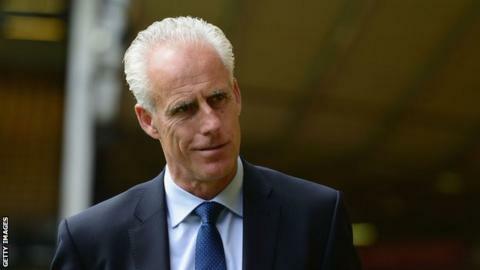 Ipswich Town boss Mick McCarthy says he feels relieved after his side secured a first Championship win since September. The Tractor Boys moved to within four points of the play-offs following the 2-0 home win over Bolton Wanderers. "I think 'phew' doesn't adequately describe it. It was getting tedious, it was tough, it was becoming really annoying that we couldn't get that win," McCarthy told BBC Radio Suffolk. "For all of us, I might add. Not just me. The fans, the players and club." The Suffolk side were top of the Championship after four games, but had gone seven matches without a win before Tuesday's victory. Meanwhile, McCarthy has once again given glowing praise about Arsenal loanee Ainsley Maitland-Niles, who scored his first senior goal in the win over Bolton. "He's great. He's a lovely young fellow and a really good pro," the former Wolves boss said of the 18-year-old winger. "I think he's settled in really well, but in terms of his ability, I'm certain he'll play for Arsenal."